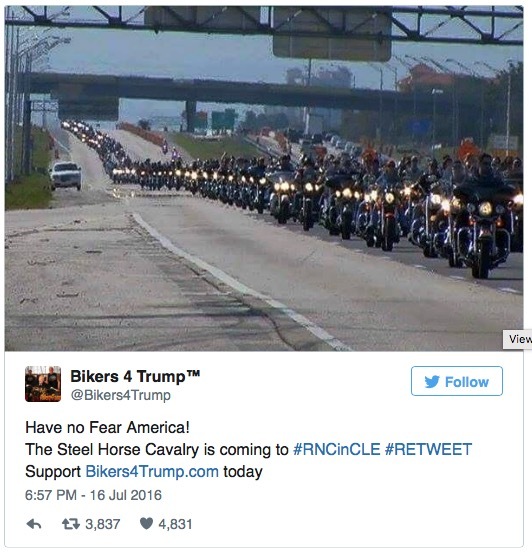 ‘Bikers 4 Trump” are heading down to Cleveland, Ohio for the Republican National Convention (RNC) in large numbers… liberal protestors are SHACKING! The Bikers 4 Trump are expected to turn out in the thousands, building a human border wall between protesters and the venue of the RNC in Cleveland. A spokesman for the organization told Fox News’ Judge Jeanine earlier this week that the bikers are expecting at least 1,000 men and women, though he said estimates have pointed to more like 10,000 bikers.